No dog owner wants his pet to suffer, especially not from pain that could be alleviated with proper medication. If your dog has an injury or chronic painful condition, you will need to work with your veterinarian to determine what type of painkiller can be used to help him feel better. Nonsteroidal anti-inflammatory drugs are one of the most commonly seen types of painkillers for both dogs and humans. Aspirin falls into this category of drugs and may be given to your dog if your veterinarian thinks it is a good choice to treat your dog's pain. NSAIDs work by reducing swelling, joint pain and stiffness. There are a number of canine specific NSAIDs on the market, including carprofen, etodolac, tepoxalin, deracoxib, firocoxib and meloxicam. These painkillers are fairly effective and safe for your pet. Negative side effects can include digestive problems as well as problems with the kidneys and liver. Steroids are an anti-inflammatory medication that may be prescribed to your dog to help control pain. Steroids work by suppressing some of the body's natural immune system responses and reducing inflammation. Reducing inflammation often helps to reduce the pain and discomfort caused by the inflammation. Most dogs are not kept on steroid treatments for long periods of time because, while effective, steroids can cause long-term problems with your dog's immune system. Some of the most commonly prescribed steroids for dogs are prednisone, corticosteroids, dexamethasone, prednisolone and betamethasone. Opiates, which are considered a narcotic painkiller, may be prescribed in short doses and typically are used to treat high levels of pain that may be associated with serious injury or major surgery. Most veterinarians choose not to prescribe narcotic pain medications for dogs due to high levels of regulation and problems that can occur with long-term use. 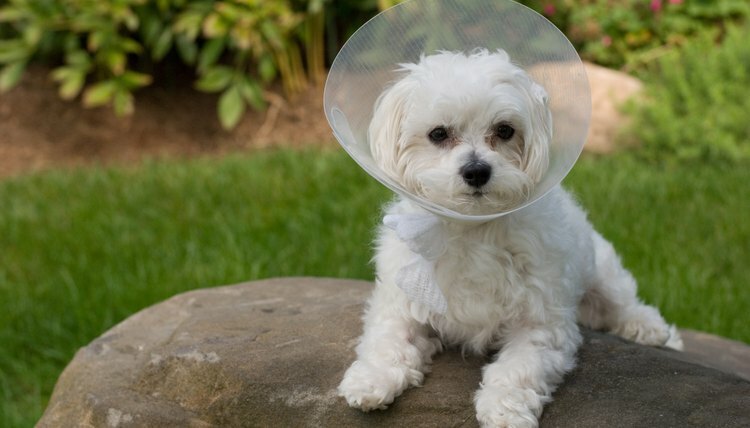 This class of drug treats pain by stopping your pet's ability to feel the pain. This class of painkillers includes morphine, codeine and paregoric. Nutraceuticals are a type of supplement that include omega-3 fatty acids and glucosamine. These can be given to your dog in addition to regular pain medications or other treatments used to help alleviate long-term pain. Natural treatments include a wide assortment of herbal products and various procedures including acupuncture and massage. Natural treatments vary in effectiveness. Discuss them with your veterinarian before you decide to try using them on your pet.